Bridgetown, Barbados, December 9, 2014 – Yesterday, CCRIF SPC (formerly the Caribbean Catastrophe Risk Insurance Facility) made an official presentation of US$1,284,882 to the Government of Barbados. This payment was due to Barbados under its excess rainfall insurance policy which was triggered by rains from a trough system that occurred in the Eastern Caribbean on November 21 and 22 2014. Barbados was the only CCRIF member country with an excess rainfall policy that was affected by this trough system. Grand Cayman, Cayman Islands, November 25, 2014 – On November 20, 2014 CCRIF SPC (formerly the Caribbean Catastrophe Risk Insurance Facility) made payouts to the Governments of Anguilla and St. Kitts & Nevis under their excess rainfall insurance policies. These payments were due as a result of rains from a low pressure trough located over the northern Lesser Antilles islands between November 7 and 8. St. Kitts’ Meteorological Services recorded 125 mm of rainfall over the 2-day period from 8:00 pm on November 6 to 8:00 pm on November 8 at the Robert L.
Grand Cayman, Cayman Islands, October 27, 2014 – CCRIF SPC (formerly the Caribbean Catastrophe Risk Insurance Facility) is preparing to make a payout of approximately half a million US dollars to the Government of Anguilla under its excess rainfall insurance policy, as a result of heavy rains that affected the country during Hurricane Gonzalo. Grand Cayman, Cayman Islands, August 4, 2014 – The Caribbean Catastrophe Risk Insurance Facility (CCRIF) is pleased to announce that eight of its members have become the first countries to purchase its excess rainfall insurance coverage – for the 2014/2015 policy year. Grand Cayman, Cayman Islands, July 8, 2014 – The sixteen member countries of the Caribbean Catastrophe Risk Insurance Facility (CCRIF) will benefit from the first ever catastrophe (“cat”) bond issued by the World Bank (International Bank for Reconstruction and Development). 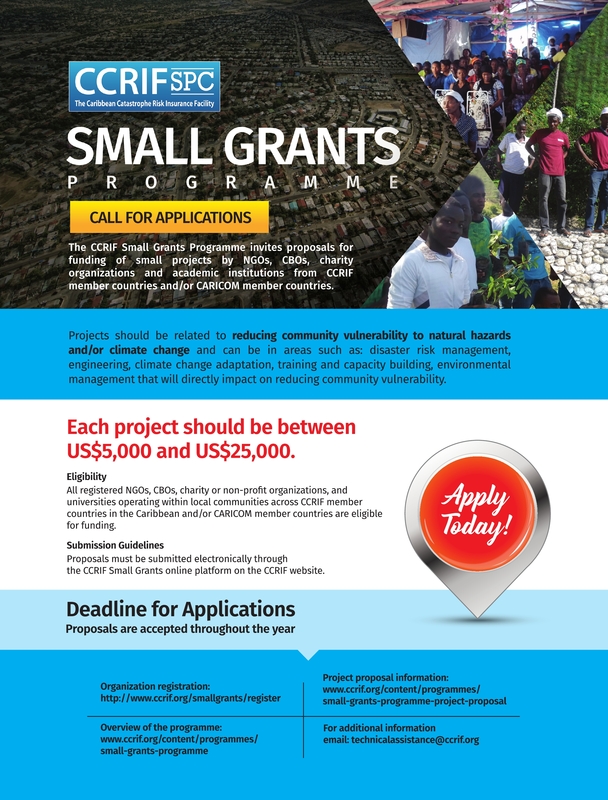 This US$30 million transaction is the first of the World Bank’s newly created Capital-at-Risk Notes Program and will address earthquake and tropical cyclone risk in the CCRIF member countries. 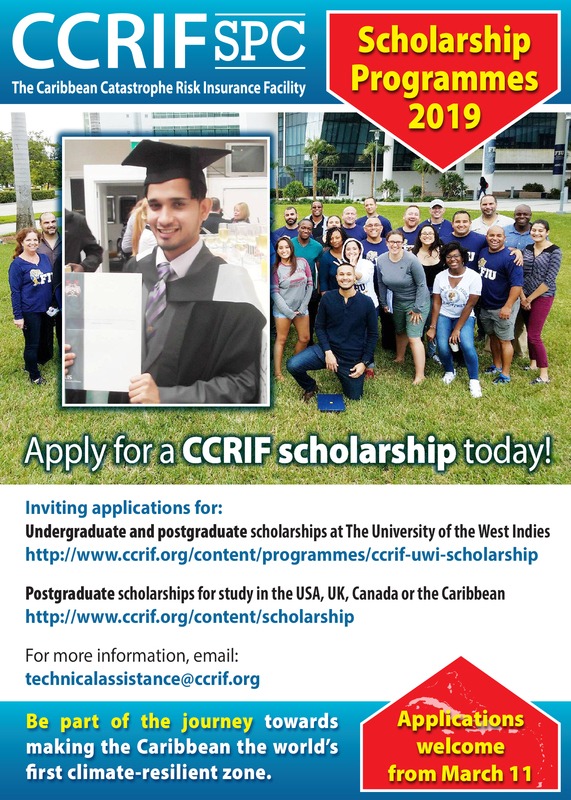 Grand Cayman, Cayman Islands, April 8, 2013 – The Caribbean Catastrophe Risk Insurance Facility (CCRIF) has expanded its scholarship programme to include Caribbean universities – in addition to those in the United States, United Kingdom and Canada, previously available under the CCRIF Extra-Regional Scholarship Programme. 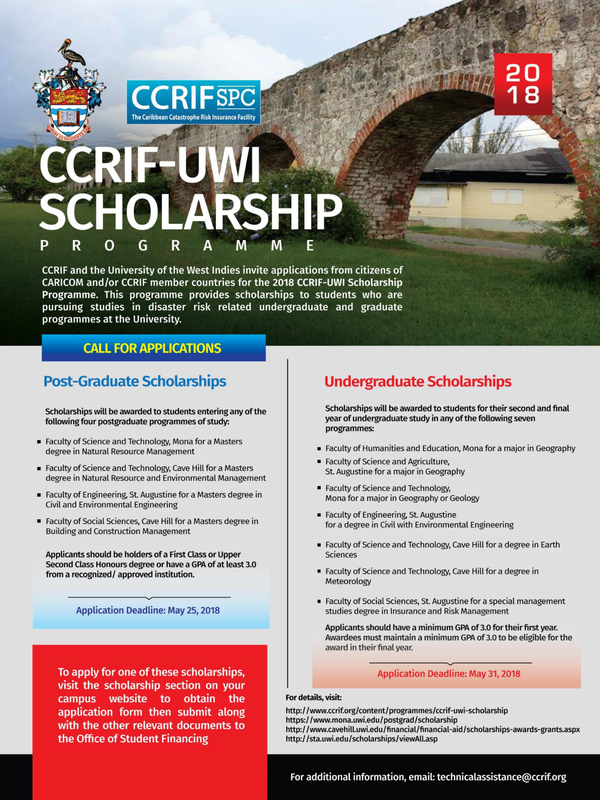 CCRIF now invites applications for its new CCRIF Scholarship Programme for 2014. The “Livelihood Protection Policy” (LPP) was launched in Grenada on January 22, 2014. This new insurance product is designed to protect low-income people against extreme weather risks. Grenada becomes the third country in the region – following Saint Lucia and Jamaica – to offer this new product, which was developed by the “Climate Risk Adaptation and Insurance in the Caribbean” project.